Earn $14.99 in Rewards credit. Click to learn more. For the first time, the 105 pedals have a carbon fiber composite body, making these the lightest and most durable version of the pedal yet. Starting with the wide-body platform Shimano is known for, this pedal provides incredible stiffness for greater pedaling efficiency. The pedal body is topped with a stainless steel plate for reduced body wear and features adjustable entry and release tension settings. I have always been a fan of Shimano pedals and these deliver. I bought these for a second bike and they perform the same as the more expensive Ultegra model. All components on my gravel-beater commuter bike are Ultegra but 105's are good alternatives that don't add much weight and still quite a bit less than Ultegra. Also, given how much the pedals get beat up, it seemed like the right call. My only troubles were getting use to getting inout of my clips. The clips have help me increase my average speed from 15.1mph to over 16.5mph. Very good pedals. I have have the ultegra pedals and I cannot tell the diffrence between them . I used a different system before but the SPD-SL are superior. They allow for a more natural feet movement, so I don't feel any strain after long rides. The platform is large and thus the force is not applied just to a single point in the middle of the foot. I could even ride in regular shoes, if I need to hop on my bike to run an errand. I just have to flip the pedals over. Clipping in is more difficult than with my previous system - sometimes I can't find the right position quickly when starting from a traffic light. But that is a minor inconvenience and something I will probably get better at with time. I swapped these in on my commuter bike this winter to replace some nice Crank Brother Eggbeaters. 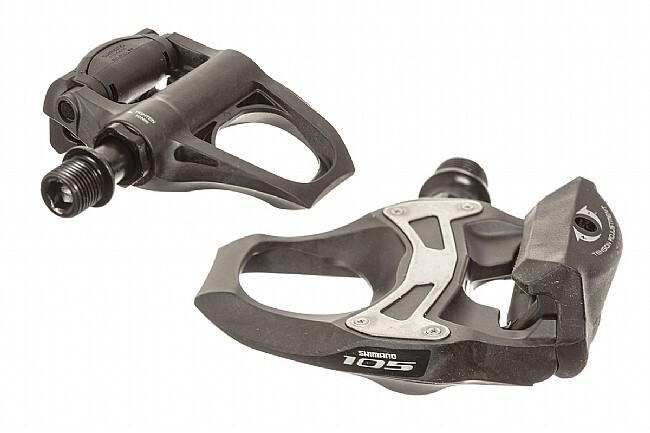 I thought those mountain pedals would be easier to get in and out of, but I think the 105 road pedals are better. I like they way they're always positioned for clipping in. These compare just fine to the Dura Ace pedals on my road bike. Maybe not quite as light but great for the price and knowing that I'll have them out in rougher daily commuting conditions. Perfect pedal for the price. Bought this pedal to upgrade my triathlon bike didn't want to break the bank so I didn't go all carbon. I felt the pedal was a high performer at a great value, and I feel like I'm getting more power output from my bike. Being relatively new to cycling i was looking for quality components without breaking the bank. These pedals fit the bill. I put them on my new Trek Domane myself. They were easy to adjust. I am well pleased with them.